Perfect Chocolate Cream Pie is adapted from an outstanding cookbook — Perfect Pies: The Best Sweet and Savory Recipes from America’s Pie-Baking Champion . The “pie baking champion” being Michele Stuart, National Pie Festival champ, Bobby Flay’s Throw-Down contestant, and owner of Michele’s Pies in Norwalk, CT.
One of these days I’ll try the Chocolate-Pecan-Bourbon Pie, the Maple Walnut Pie, Coconut Custard Pie, Lemon Chiffon Pie and maybe the Candyland Pie; but naturally, the first one on the docket was Michele’s Chocolate Cream. This may be my favorite chocolate cream pie yet. Michele took a basic chocolate pie filling and perfected the amount of egg yolks, cornstarch and chocolate to make the perfect balance of smoothness, sturdiness and chocolate flavor (though I did add a little chocolate extract since I’m putting it in everything these days). Also, the pie slices beautifully, which is important when you’re trying to make a great presentation at Thanksgiving or just about any other event where you need to impress people. Here’s my adapted version of the recipe, but do yourself a favor and buy the book! An easy and delicious chocolate cream pie based on a recipe from Michelle's Pies in Norwalk, CT. Cook time listed actually represents chill time. Off heat, whisk the sugar, cornstarch, and salt together in a medium size saucepan. Whisk in the milk and egg yolks. Place the mixture over medium heat, constantly whisking and scraping the sides of the pan until the mixture begins to bubble and thicken. Add the butter 1 tablespoon at a time. When all of the butter is mixed in, add the vanilla and chocolate extract (if using). Add the chocolate a little at a time, giving each addition of chocolate the chance to melt into the filling before adding more. Keep the mixture over the heat until the chocolate is smoothly melted and the cream thickens. Pour the chocolate filling into the pie shell. Cover the pie with plastic wrap and place in the refrigerator to cool and chill (Note: I like to let it cool at room temperature for about 40 minutes, first). When ready to serve, remove the pie from the refrigerator and remove the plastic wrap. Whip the cream and sweeten it with the powdered sugar. Stir in some vanilla. Spread or pipe whipped cream over the top. Crust Normally I’d make chocolate cream pie with graham or chocolate crumbs, but in this case a basic pastry crust worked perfectly because it made the pie easy to slice and was a nice savory relief from the filling. I used Crisco’s recipe for a double crust pie (the pie has one crust, but I wanted to make sure I had plenty of dough to flute the edges) and blind baked it with pie weights. Use whatever pie crust you like and don’t let making the crust scare you off! And don’t worry about using an all-shortening crust because you probably won’t miss the butter. It was the saltiness of the crust combined with the chocolate filling that made it so good. Filling The change I made to the filling was to add about 3/4 teaspoon of chocolate extract. 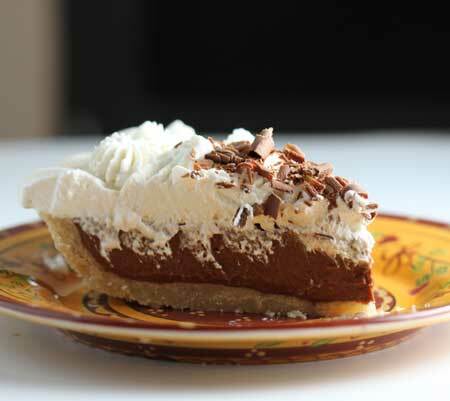 You could definitely taste it in the pie, so make sure to use a good chocolate extract. The only one I’ve tried is Nielsen Massey’s and I’d say it’s good. Also, I added both extracts after taking the pie filling off the heat. I noticed in Michele’s recipe it’s added as the filling is being cooked, but I am in the habit of adding it last because I’m always worried it will burn off. Topping If you want less whipped cream, use only 1 cup cream and 2 tablespoons sugar. I like more cream so I whipped 2 cups of heavy cream and added 1/4 cup powdered sugar and 1 teaspoon of vanilla then piped it on with a large French star tip. You could spread it on or just pipe big dots of it out of a zipper bag with a hole cut out of the corner. For the chocolate shavings, I stole some Hershey bars from Fuzz’s Halloween candy stash and shaved off bits with a peeler. Here’s a new and improved photo. Glad you enjoyed it. Hooray! Loved this recipe. Thank you. Have made it twice now and very yummy. Lots of of comments on how delicious it is. Unsweetened chocolate really packs a punch since it’s all chocolate and no sugar. 3 ounces was definitely enough. That being said, I have a new favorite since trying this one. 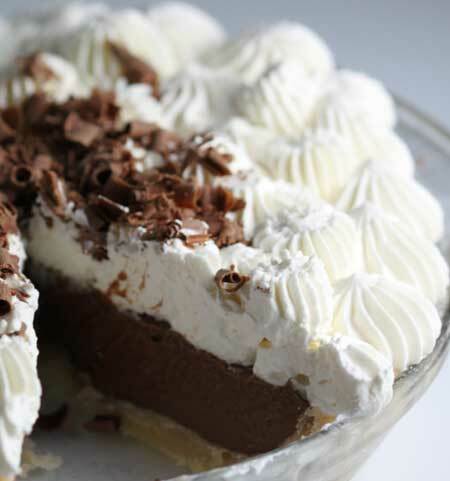 Check out King Arthur’s latest chocolate cream pie recipe. This one is good, but I like KA’s better. Here’s a link to where I reviewed it along with links to the recipe. This recipe only calls for 3oz of unsweetened chocolate. Is this nough chocolate? Other recipes call for more or adding some bittersweet. Thoughts? Happy Easter to you, too! I hope you like the pie. It’s been a while since I made this one but it was really good. THANK YOU very much! Happy Easter!! I’ve never had a problem with cream getting droopy, but I usually buy heavy whipping cream as opposed to heavy cream which tends to hold up better. So when you’re shopping for the creamy, look for heavy “whipping” cream. Looks amazing and will be trying this for easter. One question, I wanted to make it ahead of time and then bring with me later to a party. Will the whipped topping be OK if I keep it in the fridge before the party? I just put this on the to-make this Thanksgiving list. Had a request for a good chocolate pie and I always just make French silk, but want to try something else. I’ve got this book checked out from the library right now, and was looking at the chocolate cream pie recipe tonight! I went with something different, but I’d like to try this one too. The book looks great. This looks so delicious! It will make which pies to make for Thanksgiving dilemma even more difficult. 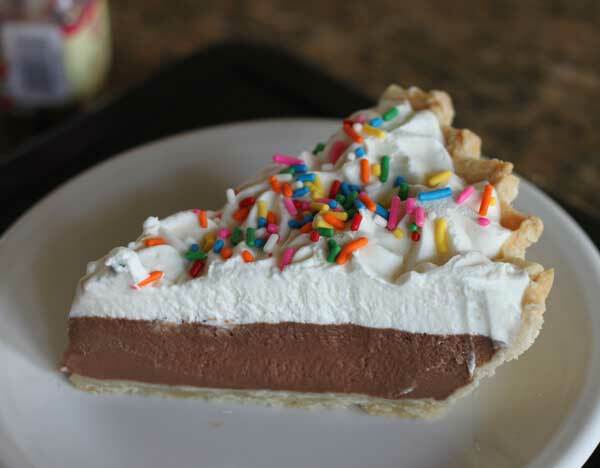 I was recently thinking of making a chocolate cream pie, but I didn’t want to go through the trouble of buying chocolate cookies for the crust. Next time I’ll do what you do — it does cut so nicely! Anna, you did a beautiful job decorating the pie, and I’m sure it tastes delicious. It looks like it has a perfect consistency and balance of flavors. Wow! I love pies with semi savory crusts!! Is this a bit like french silk? It looks delicious! What do you do with all the desserts you make? You don’t look like you eat much of them!! I used to bring everything to work…now that I’m not working, I’m less motivated due to the evil nature of desserts!!! I does look like the perfect chocolate pie to me! Thanks for the recommendation. I started reading your site years ago because I’ve always loved making cookies. But I’ve made this year all about pies. I’m putting that book on my Christmas wish list for Santa! Ooooo this looks so rich and delicious! I may have to try this one as my boss is always asking me to make chocolate pie :). This pie sounds heavenly and will be made for our Thanksgiving feast. DH loves chocolate and I think this pie will fit the bill nicely. Thanks!